Okay, it seems no one was able to deduce yesterday's Person-of-Mystery. Roger started thinking along the right path, namely that where I'm living is not where I came from. I was born on the island of Guam in the Pacific and we moved here to San Luis Obispo when I was in elementary school. So, if you had known I was from Guam, it would have been easier to figure out that this is George Tweed, the American naval radioman who was stationed on the island when the Japanese invaded during World War II. Instead of surrendering, Tweed took to the hills figuring that the Americans would come and retake the island within weeks. 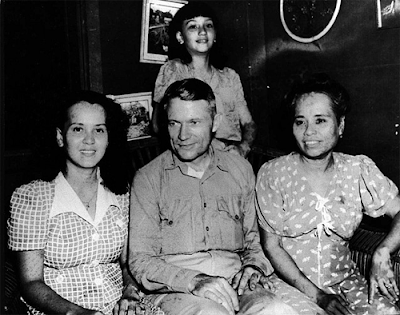 Instead he survived years on the run (as the Japanese were daily looking for him), aided by local Guamanians who sometimes suffered torture and death to conceal his locations. Five other Americans also hid, but were later found and beheaded by the Japanese. There was a book written about his time on the island, Robinson Cursoe, USN, and also a 1962 movie titled, "No Man is an Island." The movie is pretty good, but the studio used Filipino actors instead of Guamanians, so they can be heard speaking Tagalog instead of Chamorro, but it's still a pretty good movie. Curiously enough, when the Americans retook the island in 1944, several Japanese took to the hills and hid for years, the last one being captured in 1972 when I was there. I was doing searches for WWII radio men, but never came close. Just to many to look at. Though his photo did show up in the search, it didn't look enough like him to pin it down as your man. I figured there was a chance you'd still get it, Roger, but I reasoned that most didn't know I had come from Guam. This photo is from an old Life Magazine article after he was rescued in 1944. Maybe sometime I'll write about the island life. I was searching for war time radio men as well. ( I guess the head gear gave it away). I went to Korea and even Vietnam after finding no answer with WWII. I inferred your home town to be San Luis Obispo from your April 8 posting so I was searching for famous San Luis Obispoans? Obispoites? Obispoers? Wow! interesting story Nate. The phones and apparatus in the background sparked my curiosity but as usual I'm left at a complete loss. Born on the island of Guam. Was your dad military? My dad was stationed on Guam in the late 50s and we lived right on the waterfront. You could see the daily rains move in, from the distance to overhead. Another world, I understand that so much has changed.